Copyright: You grant 1650 gallery the right to use accepted photographs to promote the exhibition, for display on the 1650 Gallery website and for inclusion in an exhibit catalog. The artist's name and photo title will be included in the exhibition, and wherever the work is displayed. 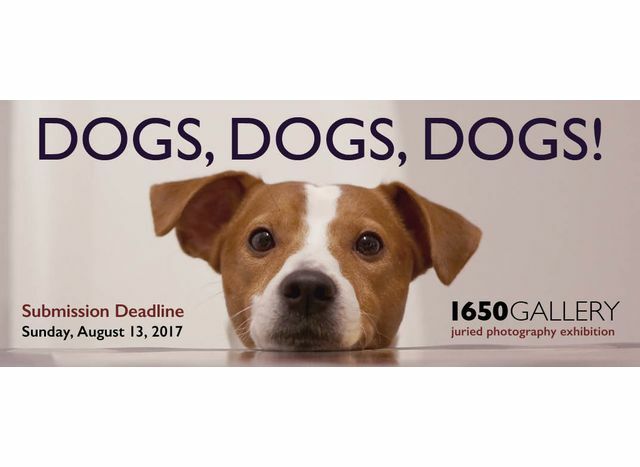 Entry fee: $35 for up to 5 images. Additional entries may be submitted for $5 each. Dogs — what gives? Furry interlopers of mind and spirit, loveable self-centered freeloaders; they want all your food, but do they ever share theirs with you? No! Backseat drivers! Smiley connivers!! Dumpster divers!!! Why do we love them so? Our protectors — deep down we fear them, because they can so easily destroy us if they don’t like us. Smarter than us — they can sniff your birthday cake and create a hierarchical list of ingredients in their head. Best In Show, 2nd Place and 3rd Place will be awarded and posted online after the show opening. Award winning photos will be featured on the show page and Best In Show winners will have a small portfolio of their work (up to 10 images) featured in our 1650 Spotlight gallery of photographic excellence. Image requirements: JPG format; 72 ppi, image width up to 1024 pixels on the longest side. Online submission of digital images. All accepted entries must submit a high res jpegs to be included in the printed catalog. E-mail JPGs and an application form to [email protected] All accepted entries must submit a high res jpeg (300-360 dpi, minimum size 5×7) to be included in the printed SHOW CATALOG.